OK, there are times when I come up with some fairly outlandish culinary creations. In this particular case I use the term "culinary" with quite a bit of artistic license. This, my fellow foodies, is in deep left field, at the warning track. This dish is a very vivid illustration of how much I enjoy finding creative uses of leftovers. It's not a recipe, but rather, just a wild-eyed experiment that I want to share. Sandi made sweet-and-sour meatballs for our church Christmas social this past Friday. As always, we had enough food for roughly three times as many people as showed up. Oh, and I had to bring finger sandwich fixins so that I wouldn't show up empty-handed. Food is a terrible disease. Anyhow, we had a bunch of meatballs left and I felt compelled to use them. Sweet-and-sour meatballs are a bit if a culinary contradiction to begin with, so why not build on it? Chinese spaghetti and meatballs? Yup, I went with it. 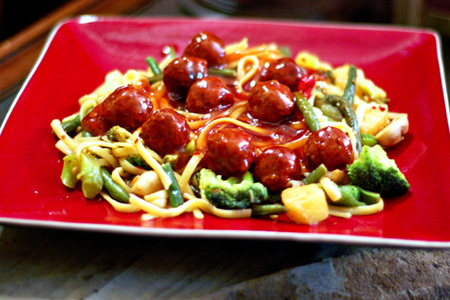 This is nothing more than a stir-fry of cooked linguine, frozen stir-fry veggies, mushrooms, and pineapple chunks that is served with a generous portion of the sweet-and-sour meatballs on top. For the stir-fry I used peanut oil, ginger, garlic, a dash of fish sauce, and some red chile flakes. I added a little hoisin sauce at the end to add a little added flavor complexity. They are absolutely perfect but maybe I'll forego adding the pineapples. Can you post the recipe for this? Thanks!